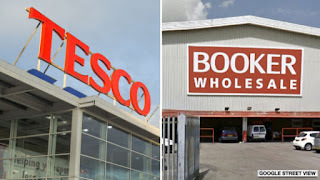 Britain's competition watchdog is launching a full-scale probe into Tesco's £3.7bn takeover of wholesaler Booker on concerns it could leave some customers worse off. The Competition and Markets Authority (CMA) concerns centre on more than 350 local areas where there is an overlap with Booker-supplied franchises such as Premier, Londis, Budgens and Family Shopper. It said that in these areas shoppers "could face worse terms when buying their groceries". Tesco operates more than 3,000 shops across the UK while wholesaler Booker supplies its services to more than 5,000 so-called "symbol" stores under well-known brand names. "There are concerns that, after the merger, there is potential for Booker to reduce the wholesale services or terms it offers the 'symbol' stores it currently supplies, in order to drive customers to their local Tesco," the CMA said. Tesco revealed in January that it had agreed a surprise deal to swallow up the wholesaler - claiming the takeover would "delight consumers" and result in "better availability of quality food at attractive prices".